Superb, fresh to the market Oil by Willem Van Mieris. Beautiful detail/subject matter. Willem van Mieris (3 June 1662–26 January 1747) was an 18th century painter from the North Netherlands Willem van Mieris (Niderl. Willem van Mieris; 3 June 1662, Leiden—26 January 1747, Leiden) was a Dutch portrait painter, author of historical and genre paintings. 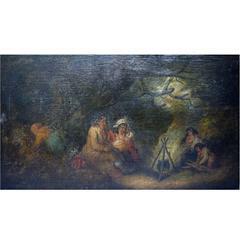 Worked in the tradition established by Gerard Dou Leiden art school. Willem van Mieris was born into a family of artists. His father, Frans van Mieris the Elder, was a famous pupil of G. Dou, the older brother of Willem Jan van Mieris was also a painter. After training in the workshop of his father Willem in 1683 by the Guild of St. Luke became a member of the Leiden Guild of artists. 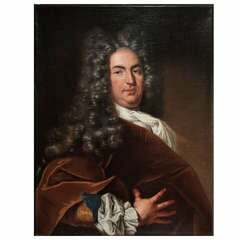 In 1687, 1698, 1704 and 1708 he managed the Affairs of the Guild in 1699 was elected its Chairman. In 1694 van Mieris, together with the painters Jacob van Tor Van Mieris Oils are held in the Wallace Collection,Victoria & Albert Museum and the National Gallery. 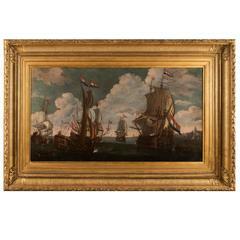 Italian or Dutch old master painting, oil on canvas, circa 1700 Measures: H. 61, W. 81 cm. H. 24, W. 31.8 in. Unknown old master. Oil on canvas, circa 1800. People around bonfire in the forest. Signed illegible. 98 x 57 (106 x 65) cm. In good condition. Crazings. Italian old master painting, 17th century, oil on canvas. Good condition Measures: H. 54 W. 43 cm H. 21.2 W. 16.9 in. 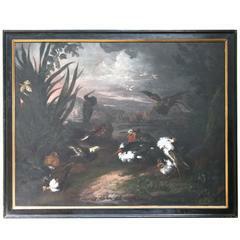 A Flemish School old master painting of ruffs in a landscape, dating from circa 1680. Dimensions: Framed - 45 x 56 inches. Unframed - 38 x 49 inches.